Retirees – Estate Booster Strategy – Innovative Retirement Strategies, Inc.
You can’t take it with you! Leave it to your heirs as efficiently as possible. When you’ve saved enough to live the retirement lifestyle you want, its time to think about how you can maximize the estate you leave to your children. ​The Estate Booster Strategy is a great little trick to leave behind more than you’ve saved. The ideal candidate for this strategy is an active retiree or someone who will be retiring soon and who has successfully saved more than they can possibly spend during retirement. This person may have a lot of tax-advantaged funds in a Traditional IRA or 401(k) Plan. Anyone who has money in a qualified plan and must eventually start taking the Required Minimum Distribution (RMD) or face IRS penalties, should definitely take advantage of this simple strategy. Here’s the deal: you can’t forget about taxes. All of the money you put into your 401(k) and Traditional IRA went in pre-tax. You haven’t paid your taxes yet. Your withdrawals will be taxed as regular income. So if you see a balance of $1,000,000 on your account statement, you really have about two-thirds of that. Those of you in California? You may see less than half of your account statement value. Use a specially-designed life insurance policy to leave your heirs MORE than they would receive if they inherited the IRA. Let’s look at Jim. Jim is a married 63 year old with $266,000 in his Traditional IRA. He’s got his assets working very conservatively to avoid market exposure. He’s got a really good pension coming in from his lifelong employer and really doesn’t need the money in his IRA. If he leaves it where it is, he will eventually have to start taking the RMD and paying income tax on the withdrawals. After consulting with Innovative Retirement Strategies, Jim implements the following plan to get the money out of the IRA and leave even more for his wife (if he dies first) or his children. Jim purchases a Single Premium Immediate Annuity (SPIA) with a 10-year payout period. This strategy locks in the amount that will be received by his beneficiary. And remember, the death benefit of a Modified Endowment Contract is received tax-free, so it is the equivalent of receiving $660,112 in taxable dollars. 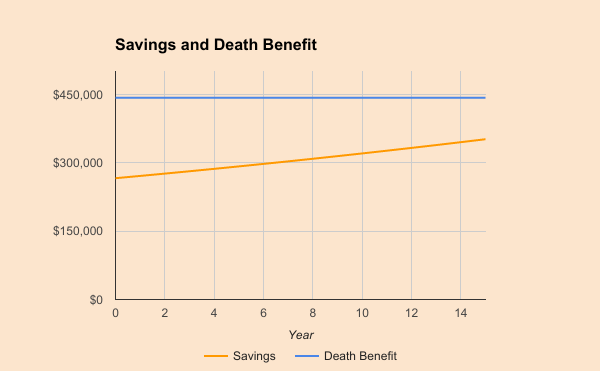 This chart shows that Jim’s beneficiary will receive more from this Estate Booster Strategy whether he dies tomorrow or lives another 15 years. One thing to keep in mind here is that this chart is showing the actual dollars. His “Savings” in his IRA hasn’t been taxed yet and the death benefit will be tax-free. The real difference is even greater! 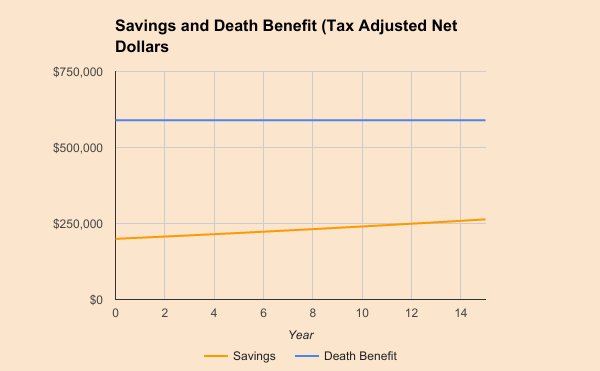 This chart shows a comparison of the net proceeds available from a taxable IRA versus the tax-free death benefit of a Modified Endowment Contract. His spouse will receive MUCH more money if Jim suffers an early death. His heirs will receive more on a tax adjusted basis at any point during the 15 years. The policy’s cash value is available if it is absolutely necessary. The policy includes “living benefits” that will pay Jim a portion of the death benefit in the event he becomes chronically ill.
Let’s meet Mary. Mary is a 59 year old and is all set for retirement. She has a good pension coming in from her employer and between her IRA and an Annuity she purchased many years ago, she will have all the income she needs. She also has $50,000 in CDs and is very disappointed with the low interest rates she is receiving on this money. She intends to leave this money to her grandchildren when she passes. After consulting with Innovative Retirement Strategies, Mary implements the following plan to boost the value of the inheritance she intends to leave her grandchildren. She purchases a Modified Endowment Contract with a death benefit of $112,360. The first year cash value of this policy is $38,539. That’s it! Its a pretty simple plan. This chart shows a comparison of leaving her savings in CD’s and leaving it to her grandchildren upon her death versus purchasing a Modified Endowment Contract with the grandchildren as beneficiaries. Her grandchildren will receive MUCH more money (and tax-free!) if Mary suffers an early death. Her grandchildren will likely receive much more than the CD’s would have ever gained. The policy’s cash value is available to Mary if it is absolutely necessary. The policy includes “living benefits” that could pay Mary a portion of the death benefit in the event she becomes chronically ill.